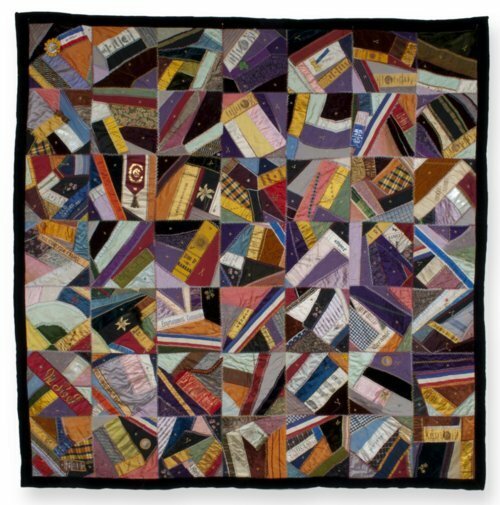 Crazy Quilt made up of irregularly shaped multi-colored silks, satins and many printed silk ribbons from meetings of the Kansas Federation of Women's Clubs, the Kansas Council of Women, State Bar Association, and other organizations. Dates on ribbons range from 1882 to 1930. One includes a 1928 Republican National Convention button depicting Kansan Charles Curtis. Most fabrics are outlined in featherstitch embroidery, with scattered embroidered stars and scissors. Hand-stitched. Bound in black velvet and backed in pale green silk. This quilt belonged to William Agnew Johnston and Mrs. Lucy Browne Johnston of Topeka. The Johnstons were active in the Kansas Equal Suffrage Association (K.E.S.A.) and the Men's Equal Suffrage League (M.E.S.L.) of Kansas, two organizations that were critical allies in the 1912 ratification of the Woman's Suffrage Amendment to the Kansas constitution. This amendment made Kansas the seventh state to enfranchise women. Lucy Johnston was president and campaign manager of K.E.S.A. in 1911-1912 during the final push for ratification. She also was active in other women's clubs and lobbied for better libraries around the state. Her husband, William Agnew Johnston, was Chief Justice of the Kansas Supreme Court and an active member of the M.E.S.L. of Kansas, an organization that canvassed the state for woman's suffrage.